Safety Card, 2017, audience participation, directional speakers and screen-print, dimensions variable. By using directional speakers to bounce sound around the room, the audio aspect of this work appears to travel with the viewer as they navigate their way around the space. The voice details the artist’s pre-surgery daily routine, which includes wearing a chest compression vest and applying testosterone gel, delivered as though it’s an inflight safety announcement in preparation for take-off. The sound appears to change direction, until the viewer steps closer towards what appears to be an enlarged in-flight safety card taken directly from a budget airline. At this point, the highly stylised icons and images within the adapted safety card screen-print match up with the audio, giving the viewer a multisensory experience not often associated with printed matter. By altering the familiar language of aeronautic travel, Safety Card becomes unhelpful in its original purpose, but instead offers the viewer an insight in to this unfamiliar process that many transgender people deal with on a daily basis. 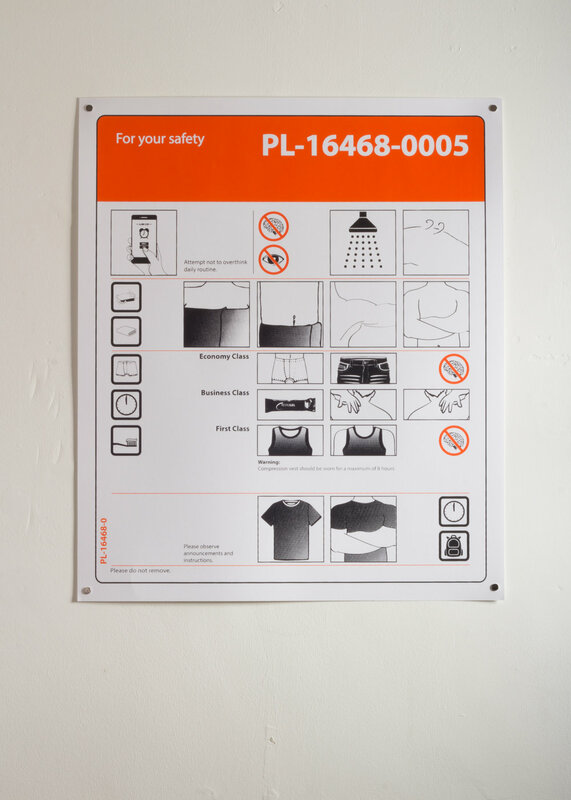 This experience seems at odds with the experience that the viewer is looking at, as the process detailed within Safety Card is one that many viewers will never have to experience directly.